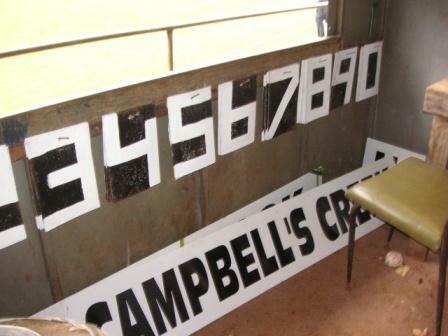 First year Trentham reserves player Daron Jacks took this photo at three-quarter time in the seniors match between Trentham and Campbells Creek . Rested and showered after a 128 point win in the curtain raiser, Daron then watched his senior team-mates have a big win in the last game of the home and away season. The final scores for the main game were 26.12-168 – 9.7-61. Full forward Ty Priest bagged 10 goals (his second 10 goal effort for the year). Both Saints teams are playing in the 2012 finals of Maryborough Castlemaine District League, with the seconds aiming for back-to-back flags. The Saints in action, via their website. My L-plater son wanted to clock up some driving hours. I felt like checking out some scoreboards. It was midweek so we knew our options were limited. No games, maybe locked up scoreboards. We headed up the Ballarat Highway. First stop was Rockbank, where we found a red corrugated scoreboard sitting in the mist, with some positive graffiti on the back: Rockbank Rules. Next stop was Blackwood – no footy ground there but a gorgeous little cricket oval beside a creek and abutting a hill of gum trees. Third stop was third time lucky. 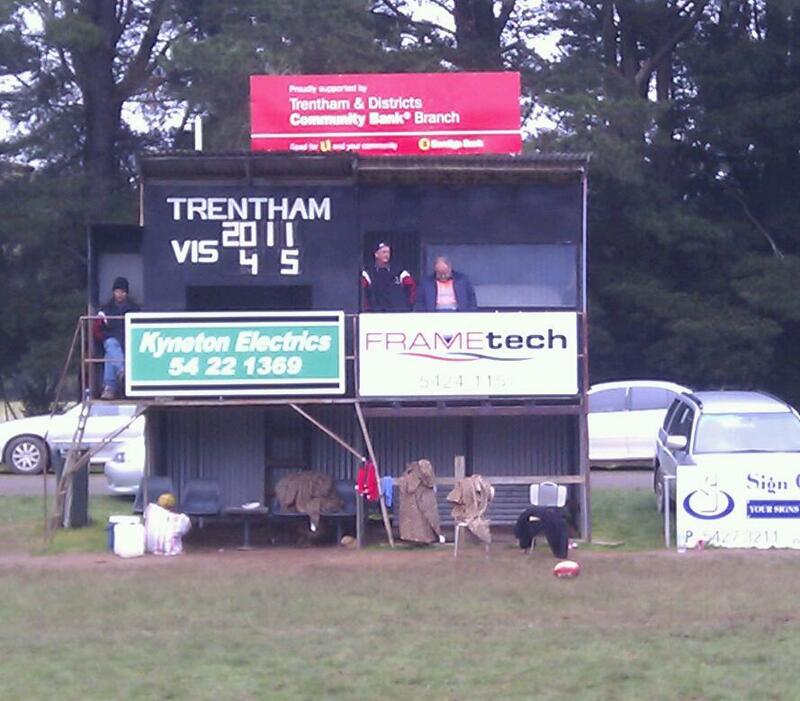 The Trentham scoreboard was unlocked. We pottered about, checked out the numbers and names and headed to Daylesford. I thought a visit to the hot springs could be fun but the springs are not what they used to be. They are part of, and maybe were the forerunner to, the day spas/beauty therapy/relaxation centres that seem to be now invading the suburbs. But I figured we’d driven this far, so we may as well partake of the waters. But it was all too piped-music peaceful. Too warm, too calm. After the disappointment of the spa we popped up to the Hepburn Springs footy ground (where the scoreboard and timekeepers’ box is called Laurie’s Castle), then to the two grounds at Daylesford (home ground of Bulldogs’ champion Chris Grant) and finally to the Ballan ground. My son had clocked up a few hours of country driving (though he’s probably still wondering why his dad shouted him to an hour at a freakin’ day spa) and I’d satisfied some scoreboard curiosity. 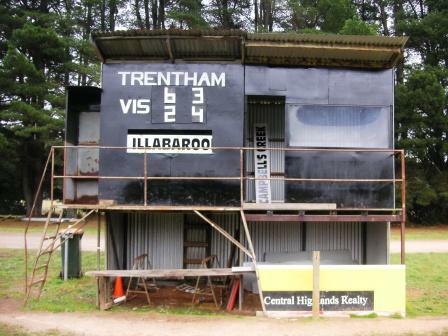 Trentham play against such clubs as Natte Bealiba, Carisbrook, Campbells Creek, Lexton, Talbot, and others.